Story Book Lodge was founded by an exceptional teacher, social worker by the name of Elizabeth Speriestersbach, born in 1897 in St. Paul, of German immigrants. Elizabeth moved up to the iron range to teach and work at a 4-H camp near Virgina, Minnesota. In 1929 a 45 acre plot on Cedar Island Lake was purchased by Elizabeth for $1,700 at a sheriffs sale. The land came with just one small 10’ by 12’ hunting shack on it. However, it had beautiful small red pine and birch trees, 1000 feet of lake shore and four small islands. 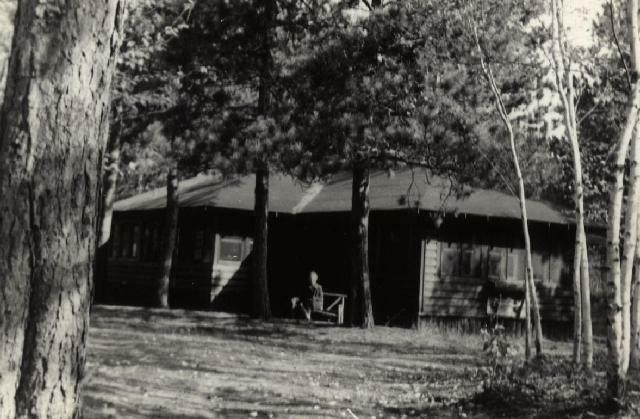 With Elizabeth’s limited teacher’s salary, and the help of many unemployed workman, cabins were built during the ‘30’s that represent story ideas; Three Bears, the Pumpkin, Bird House, Farm House, Den, an enlarged Lodge added around the original shack with a beautiful stone fireplace. All of these had appeal to the people and “Story Book Lodge” became well known. In 1941, Elizabeth’s life changed, she heard the Gospel from some of her friends and at a Gospel tent meetings. She realized her bankruptcy as a sinner and came to trust the Savior, the Lord Jesus Christ. It proved a rebirth in her experience, at age 44, giving her a new vision for winning others to Christ. Elizabeth now wanted her lake property to be a means to that end. In 1948, Elizabeth prevailed upon Ben and Jean Tuininga to come for a one week camp with boys and girls. There where eleven campers, Elizabeth was the cook, Jean was life guard, counselor, hand crafter, and story teller. Ben was camp director, counselor, Bible teacher, and became known as “Uncle Ben”. No fees where charged. Several came to Christ. The total cost of the week’s operation was $137 which Elizabeth paid, as she was treasurer. During the 50’s camps expanded to first 4, then 6, and finally 8 weeks, and later 2 weeks of family camps were added. Each camp was for two weeks and some 35-45 campers. The Den was the first dining room for 16 people with a very small kitchen. In ’54 the Ranch house became Elizabeth’s home and basement could seat some 45 for dining. Running water and a small toilet seemed luxurious! Prior to this, all dishes were washed outside, rain or shine. Some employees from Erie Mining Company were impressed with the camp and Erie donated a complete kitchen equipment set. A dining hall was needed and built near the lake, by men during a strike time at Erie. During the mid-sixties a total land tax structure change took place and it became evident that the property, as well as the operation, of camp had to become a non-profit, tax-exempt property. Elizabeth expressed a desire to form a total ownership under Story Book Lodge Christian Camps. In turn, the board arranged for her living and that of her brother and sister. Hundreds have assisted in counseling, lifeguarding, and working. Thousands of campers have been served. Hundreds have confessed being saved. Many people served, helping, warning, encouraging, giving, working, checking, advising and praying — that has been the testimony of Story Book Lodge Christian Camp as the Bible and the Gospel have been promoted.